The 737-1/200 had system A powered by the two Engine Driven Pumps (EDP's) and system B powered by the two Electric Motor Driven Pumps (EMDP's). There is also a ground interconnect switch to allow system A to be powered when the engines are shut down. 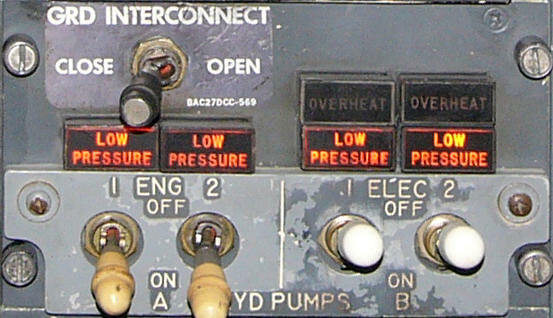 From the 737-300 onwards each hydraulic system had both an EDP and an EMDP for greater redundancy in the event of an engine or generator failure. The hydraulic reservoirs are pressurised from the pneumatic manifold to ensure a positive flow of fluid reaches the pumps. A from the left manifold and B from the right (see wheel-well fwd). 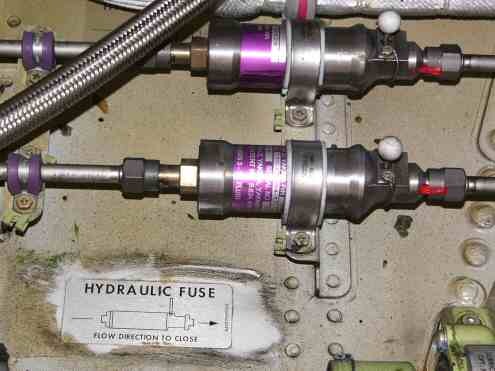 The latest 737's (mid 2003 onwards) have had their hydraulic reservoir pressurisation system extensively modified to fix two in-service problems 1) hydraulic vapours in the flight deck caused by hydraulic fluid leaking up the reservoir pressurisation line back to the pneumatic manifold giving hydraulic fumes in the air-conditioning and 2) pump low pressure during a very long flight in a cold soaked aircraft. The latter is due to water trapped in the reservoir pressurisation system freezing blocking reservoir bleed air supply. 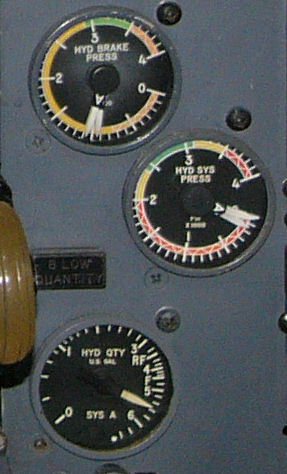 Aircraft which have been modified (SB 737-29-1106) are recognised by only having one reservoir pressure gauge in the wheel well. Also in the wheel well can be seen the hydraulic fuses. These are essentially spring-loaded shuttle valves which close the hydraulic line if they detect a sudden increase in flow such as a burst downstream, thereby preserving hydraulic fluid for the rest of the services. Hydraulic fuses are fitted to the brake system, L/E flap/slat extend/retract lines, nose gear extend/retract lines and the thrust reverser pressure and return lines. Above schematic courtesy of Leon Van Der Linde. For a more detailed hydraulic schematic diagram, click here. 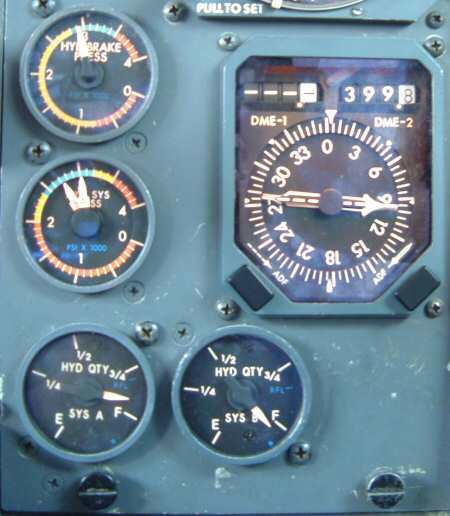 On pre-EIS aircraft (before 1988) the hydraulic gauges were similar to the 737-200. 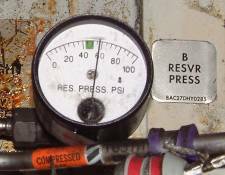 There are now separate quantity gauges since the reservoirs are not interconnected and the markings have been simplified. There is now just a single brake pressure gauge showing the normal brake pressure from system B. Notice that there is only a system A quantity gauge, this is because on the 737-1/200 system B is filled from system A reservoir. System B quantity is monitored by the amber "B LOW QUANTITY" light above. The hydraulic brake pressure gauge has two needles because system A operates the inboard brakes and system B the outboard brakes, each has an accumulator. Eg. If you are in say a 737-300 and you notice to System B hydraulic quantity drop to 64%, then from the table above, you may suspect a leak in the balance line or standby reservoir. Note: Refill figure valid only when airplane is on ground with both engines shutdown or after landing with flaps up during taxi-in. The hydraulic reservoirs can be filled from the ground service connection point on the forward wall of the stbd wheel well. NB The alternate flap system will extend (but not retract) LE devices with standby hydraulic power. It will also extend or retract TE flaps with an electric drive motor but there is no asymmetry protection for this. It should go without saying that if a hydraulic system is low on quantity then you should top up that system with fresh fluid (and find out why it was low!) to avoid cross contamination. However if you really want to move fluid from one system to another here is how to do it. Chock the aircraft & ensure area around stabiliser is clear. Release parking brakes and deplete accumulator to below 1800psi by pumping toe brakes. Switch Sys A EMDP ON and apply parking brakes. 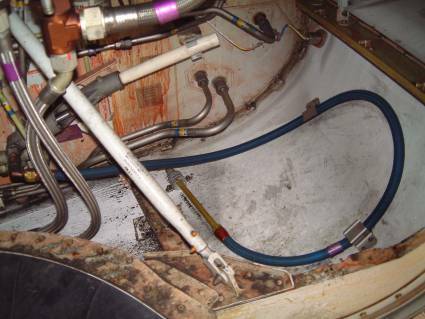 Ensure area around No1 thrust reverser is clear. Switch either FLT CONTROL to SBY RUD. Switch FLT CONTROL to ON. Switch Hyd Sys A EMDP ON. This is such a nice blog post. This blog post helps me to understand about all the basics of the boeing. Really helpful post. Thanks to you for sharing such kind of post.